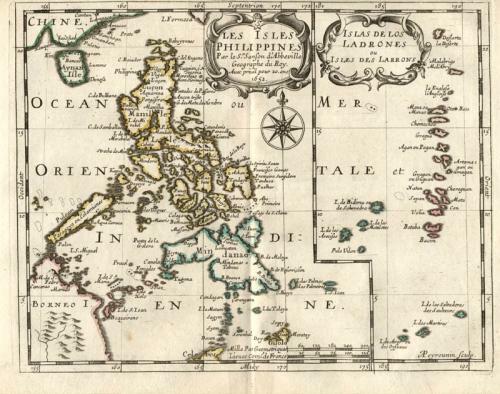 Title: 'Les Isles Philippines...' 1652 [with] Islas De Los Ladrones... Paris, 1652. From L'Asie, LAffrique, L'Europe, et L'Amerique, en plusieurs cartes nouvelles, et exactes... , Paris, [1660.] Engraved by Abraham Peyrounin. Fine, original, copper-engraved map of the Philippines and Mariana Islands, with original outline hand-color, by Nicolas Sanson D'Abbeville: Fine dark impression, bright original color, heavy paper, large margins, light browning near edges, otherwise fine. Faint ink stamp of Western Reserve Historical Society on verso.